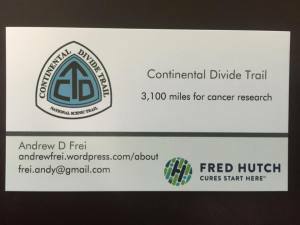 My friend Andy is about to do something really incredible: hike all 3100 miles of the Continental Divide Trail to raise money for Cancer Research. Go check out his site and donate to the cause! Thank you to those who have donated to my cause so far. You have helped me raise over $1,200 for cancer research at Fred Hutch. My goal of a dollar a mile is in sight, and I hope that I will be able to raise much more. My mom is currently doing well. I was nervous when planning my hike that I would be away and out of reach if her health took a bad turn, but I am now reasonably confident that I will be able to be able to spend a few more holidays with her. She is handling the chemo well and has been able to stay on each treatment for longer than average. Our hope is that, on the day that she can no longer tolerate chemotherapy, a new treatment trial will be ready for her. This post was co-written by KD Shives and the excellent Emily Curtis Walters. Emily Curtis Walters is a PhD candidate in History at Northwestern University. You can find her on Twitter at @emilydcw or at her blog, dighistorienne. When being thrown into the open-ended project that is obtaining a PhD, it is critically important to make consistent progress in completing the major milestones of your program. This can be more than a little overwhelming for most students, and extremely difficult for those who are not familiar with the ins and outs of modern academia (first-generation students such as Katie can attest to this!). With so little structure, it is easy to get lost in the day-to-day goings-on of graduate school, and suddenly you might find yourself a 6th-year student with no publications and no conference presentations. So how do you stay on track—or even find the right track in the first place? Academic conferences can be one of the most enjoyable experiences that you can have during graduate school. A paid-for trip, usually somewhere at least semi-exotic, to allow you to talk about the kind of work that you are personally interested in—what’s not to like about that? Well, for those of us who deal with anxiety in unfamiliar situations, attending an academic conference alone in a strange place without knowing anyone can be a difficult and demanding experience. Thankfully, I’ve managed to attend and present my work at a few different research conferences despite my own anxiety and I’ve learned how to make it through these multi-day academic marathons relatively intact. In fact, these have been some of the best professional experiences I’ve had once I got past my initial anxiety and learned to enjoy the event (even though I’m the kind of person who starts to worry about just flying a week in advance). In graduate school it is extremely important to know when you are putting your time towards professional activities that are directly beneficial to your dissertation progress versus activities that are interesting or fun but do not contribute to moving you forward. In terms of time and resources spent on experiments, staying on task is a serious consideration or else you run the risk of falling victim to Shiny Object Syndrome.